I always wondered why things were the way they were. Everyone around me was snug and secure in their faith. Was I the only one who saw all the evidence against the existence of god? My cognitive dissonance was overwhelming, but there was no one to ask. I thought I might be crazy. Then I left the theistic cocoon of North Dakota and discovered the wide world of diversity, including beliefs. I was married to a closet atheist but didn’t know it. Even if I had known, I’m not sure I would have been ready to embrace atheism at the time. Now, years later, I have let go of god, found a new, scientifically explainable world, and have regained my sanity. How different would my life have been without the lies of religion? The “why” question presumes the answer before the question is asked — that there is purpose. Does there need to be purpose? NO! Once I stopped assuming purpose, once I understood that all is randomness and chance (with heritable variation selected by nature in tiny steps over a sufficient amount of time, resulting in human consciousness and the search for meaning and invention of gods), the meaning that had constantly eluded me was finally mine! Douglas Adams was right. It’s actually the question I had wrong all along. In his Hitchhiker’s Guide to the Galaxy series, a super-mega-colossal computer (Deep Thought) is built to find the “Answer to The Ultimate Question of Life, The Universe, and Everything.” After millions of years of computing, Deep Thought says it’s not powerful enough, but it can design a computer that is. 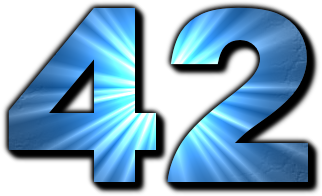 That computer, after more millions of years, says the answer is “42.” It explains that the answer seems meaningless because the programmers never actually stated the question. It tells them that to find out the question they must build an even bigger computer. That computer was the Earth itself, which was directed to be built by a race of hyperintelligent, pan-dimensional beings, one dimension of which was white mice on Earth (they enjoyed negotiating the mazes in labs). Unfortunately, after further millions of years, just five minutes before the answer is scheduled to be given, an advanced alien race, the Vogons, destroy the Earth to build a hyperspace bypass. The message is that the question of life, the universe, and everything, if we even know it, is not important. There is no final answer. With science, we can understand a little bit about how the cosmos works, but there will always be more questions than answers. And that’s where I find joy. Not just in the never-ending quest for knowledge–but even in the uncertainty. It’s a little like the struggle for existence, the delicate balance of Earth’s environment, the homeostasis always taking place in our own bodies. Voltaire said “Doubt is not a pleasant condition, but certainty is absurd.” That is not true for me. The certainty that I was expected to feel as a christian, in contrast with reality, made me very uneasy. I now find comfort in doubt, skepticism, rationality, and scientific inquiry. I somehow always knew that the safety net of religion was an illusion. I don’t need faith — I have reason. Actually life can have a purpose in a scientific context. We are created through evolution which filters on survivability. If we assume that to exist and evolve is better than extinction then what is “right” becomes what puts on on the path to positive evolution and what is “wrong” puts us on the path to extinction. Since evolution is a property of the universe and evolution favors survivability, and evolution created us, then continuing to exist is our purpose. And if we are at odds with our purpose the the angry hand of Darwin will strike us down like he did to punish the dinosaurs for not having a space program.